A hot dog is commonly served in a bun and smothered with chili, relish, cheese and even bacon. 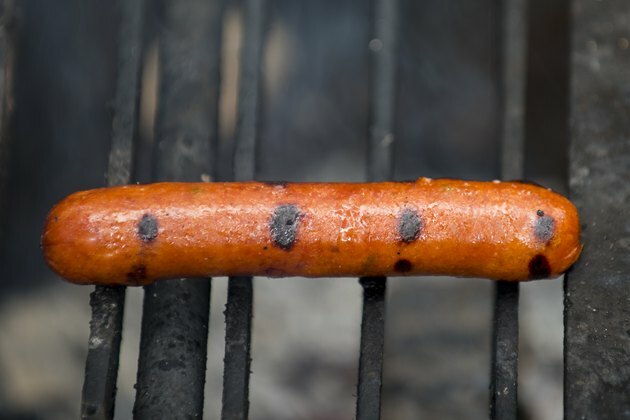 A "stand-alone" hot dog -- that is, one without a bun and condiments -- has a significantly different nutrient profile from the "full-dressed" hot dog. A stand-alone hot dog contains 175 calories. A bun would add 80 to 130 calories, depending on the size. Saturated fat, trans fat and cholesterol all contribute to elevated cholesterol levels in the body. A stand-alone hot dog contains 15 g of total fat and 5 g of saturated fat, but it does not contain trans fat, which is found in packaged foods containing hydrogenated oils. A stand-alone hot dog contains about 3 g of carbs and 7 g of protein. Sodium is an important electrolyte mineral, but not when it is consumed in high amounts. A hot dog contains nearly 700 mg of sodium. Reducing the amount of sodium you consume can help lower high blood pressure or prevent it from developing in the first place, according to the American Heart Association. The recommended daily intake of sodium is 2,300 mg.